Thank you for joining us for the Ice Inspiration Challenge and we hope you will all join us again this week too. You could choose to make a gift, a gift card, or add an image of a gift to your project. there are so many ways to interpret this challenge! We will be looking forward to seeing what you create! This week we are showcasing Mama Elephant Products. You don’t have to use them for the challenge but if you have them we would love to see them used. 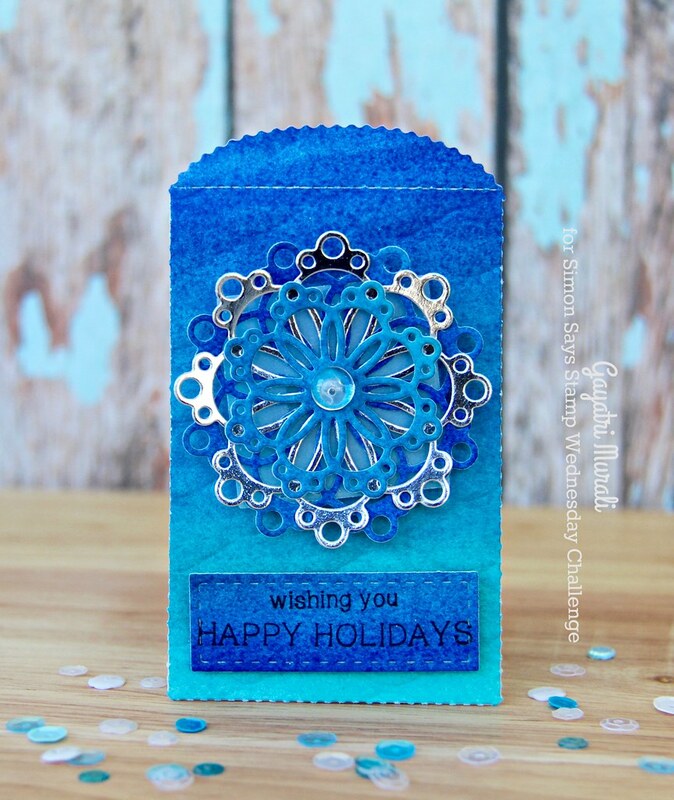 I have used Mama Elephant’s Lucky Envelope Die to make a gift card holder. 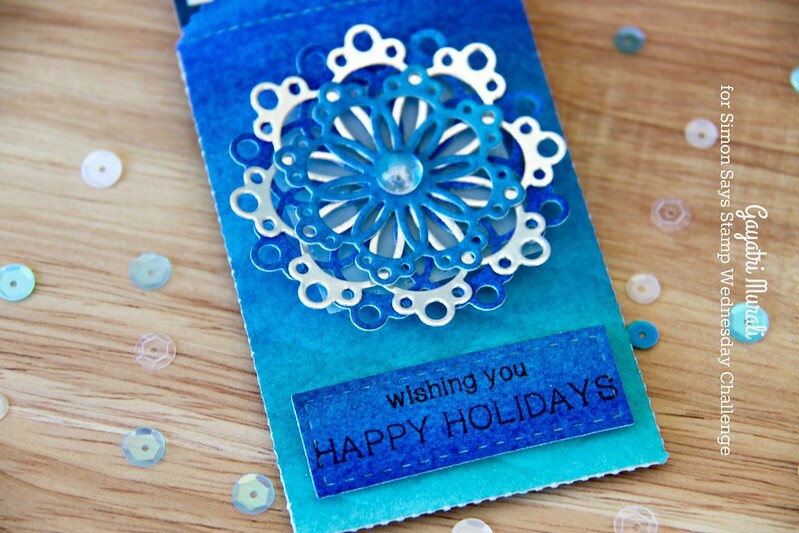 The technique I used to make this envelope is a CASE of Kristina’s Holiday Card Series 2016 Day 25. Her cards are my absolutely favourite in the the series. Love the technique. So I did exactly the same. I watercoloured my watercolour paper using Gansai Tambi watercolor blue hues. After the paper was dry. I die cut the panel using the envelope die. And then ran the die cut using a Next Level Wave embossing folder. Love the texture on the panel. It is difficult to show the texture on the envelope. But trust me it is there Lol! Then I assembled the envelope. This envelope fits an gift card perfectly. To decorate it I used Simon Says Stamp’s Snowflakes for the Season die to die cut the leftovers of the watercoloured panel as well as a silver cardstock. I used the largest two of the die in the set. Then layered the glued them with the silver die cut in the middle. I added a clear droplet at the centre. I adhered this on the envelope with a vellum square die cut cut using the die from Lucy Envelope Die. I also die cut a rectangle panel using another of die from the envelope die set and the left over watercoloured panel. 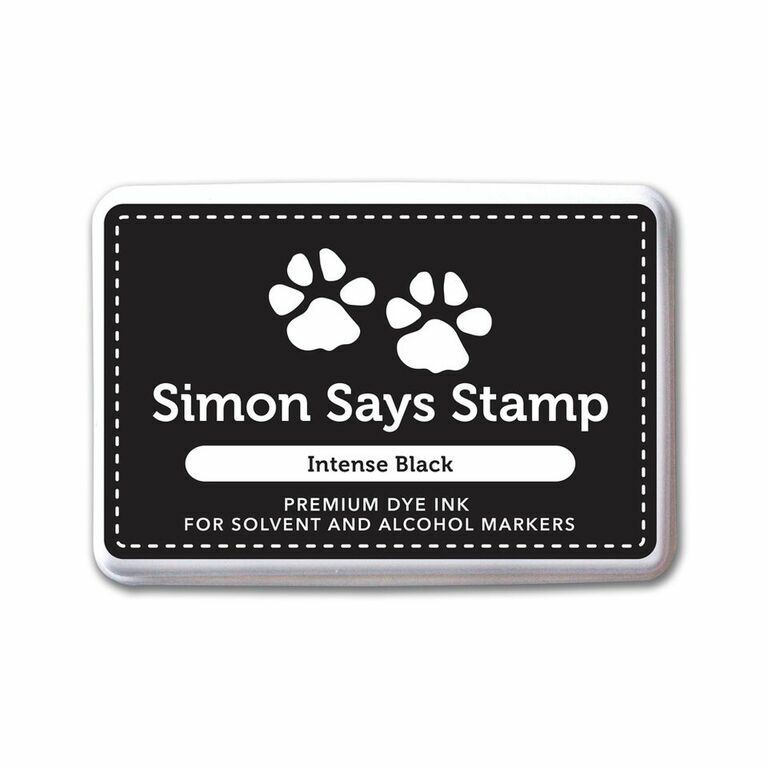 I stamped the sentiment from Arctic Christmas stamp set from Simon Says Stamp. I adhered this panel on the envelope using foam adhesives. Rich and beautiful! I love how you CASED Kristina's card! Well done, Gayatri! This makes me smile all over, Gayatri – just love these blues! 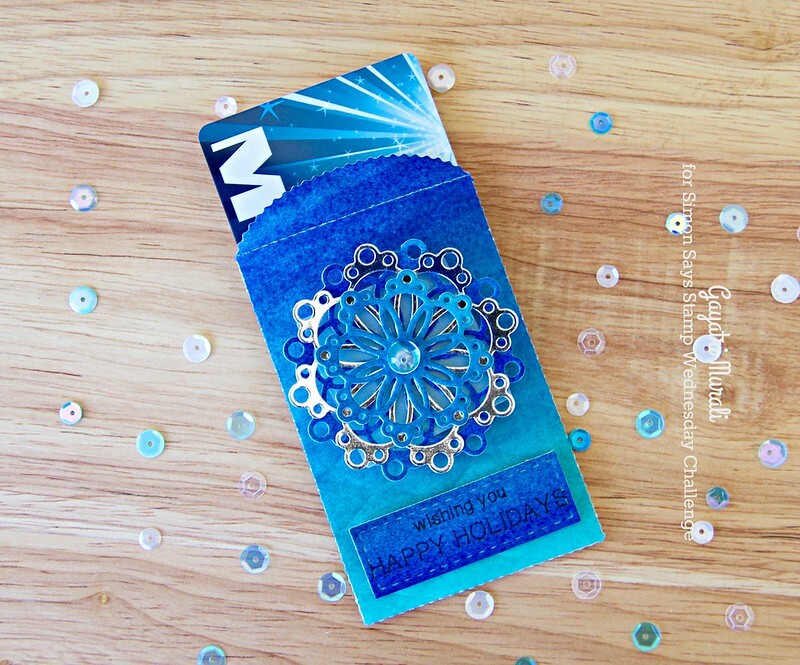 Stunning gift card holder, Gayatri! I love the blue and silver color combo! whoa! the blues on this are just so so so pretty 🙂 have a fabulous weekend! !